"A hundred bucks?!! But it's just a hobo stove!" 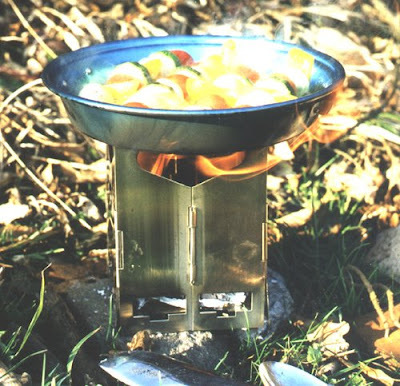 "Ah, but it's a SWISS, FOLDING hobo stove!" In 1999, Argentina's economy collapsed. The worst of it lasted until 2002 and the crisis was supposedly over by 2005, but it's still bad there. A man who calls himself "Ferfal" has become fairly well-known by writing about what it is like to be living in Argentina. He was there when things first got bad, and remains to this day. A few years ago while the worst was still going on, Ferfal was a member of a forum that I also frequented. He would check in once in awhile and upload a lengthy post detailing events in his area, what his life was like, and his thoughts in general. Lots of folks on the forum would ask him questions, which he would field the next time he was able to get online. Eventually, Ferfal disappeared from the forum, and I didn't hear anything about him for a couple of years. Today, I happened upon an interesting blog. Ferfal's blog. It's worth reading, so in addition to linking to it here, I have added it to my link list on the sidebar. BTW, here is a link to Tristram Shandy online. An old Spartan trailer in Study Butte. I am considering building an EV, but I have a real problem with your stated specifications. First, you list your (model number deleted) as 22.12 ft./lbs of torque continuous at an input voltage of 156. You give the RPM as 12,000; the HP as 18.77 and KW as 14. OK, 14 KW is 18.77 HP, but 22.12 ft/lb torque at 12,000 rpm is about 50 HP. How about supplying a real peak and continuous torque curve, complete with rpm? Also, showing current draw vs. torque output per rpm would be very helpful. This would be real data I could use to design my system. My second problem is your statement, "...and gas engines are rated at their peak horsepower unloaded." This is absolutely, blatantly untrue. Do you really believe this, or are you deliberately misleading people? Just in case you are unaware, no power source outputs anything (at its power take off) until that power is used. An engine running at no load produces nothing but heat. The way gas engines are rated is running them through their rpm range against a load brake (hence the term Brake Horsepower, or bhp), which measures torque. The load applied is whatever is the maximum the engine is able to sustain. In other words, the engine is fully loaded. Torque is measured directly, and horsepower is calculated by the formula: torque in ft/lbs x rpm / 5252. The peak hp rpm is generally somewhere around double the peak torque rpm. Also usually measured is Brake Specific Fuel Consumption, which is a measure of how many grams of fuel is consumed per hp/hr or KW/hr, which are directly convertible (as you know, judging by your rating of the *bleep* as 18.77 hp or 14 KW) as 1 hp= .746 KW. Please clear this up, so that I may make an informed choice. Update: June 10, 2010. Over two years later. They never replied. I think it's safe to say they never will. "There are dozens of good commercial and government applications for electrical vehicles, and some of them even make economic sense:-) The truth about battery powered electric cars for private ownership is that without a major and unexpected breakthrough in battery technology they will never be more than urban, short-haul vehicles." Note the use of the term "major and UNEXPECTED breakthrough". That means that, in his opinion, we are not on the brink of such a breakthrough. This is from an electrical engineer who specializes in battery technology. And as I have pointed out in previous posts, current battery technology is at most, 66% efficient. That is just for the recharge cycle, and does not take into account other inefficiencies in the total system. New super capacitors may help some in that regard, but whether they will ever be able to truly replace batteries remains to be seen. I cannot adequately express how much I disagree with what Mr. Rosenthal is advocating here, but I had to post this link because he knows what he is talking about on the practical aspects of EVs, and he tells the unalloyed truth about it. Is this a case of man bites dog? A mid-size BMW sedan equipped with a diesel engine returned better fuel economy on a 545-mile, London-to-Geneva, run than a gasoline-powered Toyota Prius. A BMW 520d with a 2.0-liter diesel engine and regenerative braking (but no heavy duty hybrid features) got 41.9 mpg while the full-hybrid Prius, 500 pounds lighter, got 40.1 mpg. "40 mpg for the prius? I have never been able to acheive (sic) any thing less than 50 mpg. This test in (sic) unscientific at best, you have two different drivers whose driving habits can be vastly different. On my prius, I average 55 mpg while my wife averages 48 mpg." While you're thinking about that, note this line in the main article: "Testers found the (BMW) 520d "not startlingly quick ... [but] it cruised happily at the French autoroute limit (dry conditions) of 78mph towards the champagne region." And this one: ...To find out, they drove BMW's midsize 5 Series sedan and the Prius London-to-Geneva, adding 100 miles to the route "to give the Prius the advantage of running in urban conditions where its petrol-electric drivetrain comes into its own." And this one: The Prius weighed 573 pounds less and had an aerodynamic shape "as slippery as a campaign manager discussing political donations," leading the testers to believe "the Prius should take less energy than the BMW to maintain a constant cruising speed." Not so. As many people know, the advantage of hybrids lies in urban driving where the stop-and-go recaptures the car's energy. On the highway, it's one more four-cylinder car pushing through the wind. So basically, according to this Prius owner, it was "unfair" despite the fact that the driver of the BMW drove it like a BMW, cruising at 78 mph, because the driver of the Prius didn't drive at bicycling speeds and only in city conditions, like a Prius owner with something to prove. It was "unfair" because all the odds weren't stacked in favor of the hybrid. Not mentioned is the fact that for 30 years VW has been building diesel cars that beat the hybrids at their own game, and there are many early versions of those still out there running around, despite being 30 years old and having a half-million or more miles on them. Let me clarify that a little more. A 1978 VW diesel Rabbit will get better than 50 mpg if you drive it like you're trying to kill it. It will get over 60 mpg if you take some pains to maximize fuel mileage. I'm not talking about hypermiling; there's no telling what it will do hypermiling. A Prius will get maybe as much as 60 mpg, hypermiling. And I can just about guarantee there will never be any such thing as a 30-year-old Prius, unless it has been in storage all those years. Now, let me reiterate what I have said in the past: I am not against hybrids per se. In fact, I think most if not all new vehicles will incorporate some hybrid-vehicle technology in the future; witness the regenerative braking on the BMW in this article. But I AM against the BS political posturing of those who drive hybrids as a form of activism, with their "holier-than-thou" attitude. If anyone wants to take me up on it, I can build (on an existing, older car like a Geo Metro) a car that will go at least 50 mph, with a fuel mileage of at least 110 mpg (US) and a cruising range of at least 300 miles, for half the price of a new Prius. Ken is very well known in the Lister diesel community. He is extremely knowledgeable about living offgrid with a diesel generator, and he's a nice guy to boot. "...there must be a better way to generate electricity at the lowest possible costs, both initial start-up costs and in running costs. Sun power was not even considered at this point as it is a complete waste of time in England "It rains or is cloudy almost all the time". We are lucky to have 2 weeks of continuous sun light without rain in the summer. The next best option is to have a mechanical motor connected to a AC generator, running on some sort of fuel, be it Petrol "too expensive", Gas "too Expensive" or Diesel "better but still too expensive". I remembered many years ago I saw a very old slow running engine with two big flywheels on a farm which was used as a water pump and ran on diesel, one of these engines would be perfect for generating electricity. 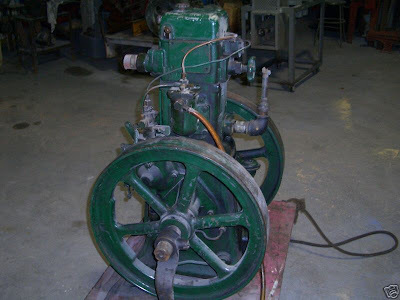 A quick search on Google about "Stationary Engines" produced a lot of results and I soon found the engine that I had seen so many years ago. ...It turned out to be a Lister type CS diesel Engine, but were do I find one from? so I looked on eBay and there it was!" This generator looks pretty rough. Here's the story: a few years ago I was living offgrid on a tract of land I own, and the Tecumseh-engined piece of junk of a generator I had used all through the previous summer had finally thrown a rod just as the weather was cooling off. This was not a huge loss, considering that it vibrated so much that I had to use bungee cords to hold the air shroud on after it broke the bolts and ripped out the mounting holes; and I had a very short piece of pipe held on the exhaust port by two bolts and a piece of baling wire, because anything with any more mass (such as a muffler) would break. The pipe did nothing to quiet the beast, but it was just enough to keep cold air from warping the exhaust valve. Needless to say, this thing was an unbalanced piece of junk, and I was almost glad when it finally bit the dust. I made it through that winter sans electricity, using a kerosene Aladdin lamp, a propane lamp, and some standard oil lamps for light. I had a homebuilt woodstove for heat, cooking and water heating, so the lack of electricity wasn't a problem. For entertainment I read and listened to a crank-up AM/FM/SW radio. When spring came, however, I knew it was time to start thinking seriously about power production. It still wasn't too bad, because the nights were pretty cool; but summer was on the way with daily highs in the 90s and occasionally over 100 degrees Fahrenheit, and with the humidity that keeps temperatures high even at night, air conditioning is pretty much mandatory. I didn't want to spend $500 on another junk portable genset that would last 1-2 years max, and I didn't have the money to buy a good generator, so I decided to take the DIY route. More fun that way, anyway. So I went to The Epicenter and bought one of the steel plates detailed in their "Tip O'da Week" to mate a lawnmower engine with an automotive alternator. Then I bought a used Briggs & Stratton lawn mower engine for 20 bucks or something like that, and a cast iron pulley to fit the shaft of the engine. It had to be cast iron, not only for longevity but also because low-horsepower vertical-shaft lawn mower engines have aluminum flywheels, and rely upon the mass of the blade for a further flywheel effect. When you remove the blade, it becomes nearly impossible to start and run unless you replace that mass somehow. Lastly, I went to Autozone and bought a rebuilt 60-amp Delco internally-regulated alternator for 20 bucks plus whatever the core charge was, maybe another $15 or so. I also picked up a v-belt to tie it all together. Then I assembled all this into the solution to my problems. Or so I thought. Until, that is, I discovered that the tiny little tank on the B&S only held enough gas for about 30-45 minutes of runtime, and the design of the carburettor was such that you couldn't just replace it with a larger tank. I gave the matter some thought, but couldn't come up with a solution that was reliable and didn't carry a high risk of creating the necessity of skin grafts to my face, so I found a Tecumseh mower engine, because they have a carb that has a built-in bowl and a separate tank that can be replaced. I never got around to putting that one together though, because a few days later I was in the Harbor Freight store and saw that they had their Robin-Subaru horizontal-shaft engines on closeout. They later changed their minds and continued to carry the Robin-Subaru line after all, but not before I scored a 7 horsepower engine for $200. So I took it home, mounted it on a scrap of treated 6x6 post, and made an alternator bracket out of scrap iron and bolts from my junkbox. So why does it look so rough? Think about it: no power to run my welder! When I started writing this, I thought about cutting the extraneous parts from the bracket and welding it up nicely, because it is, after all, a pretty good bracket; but I decided to take pics and video first, showing how it really was, after which I could improve it for the next project it is to be used on. Oh, yes: I'm gonna use it to break in an air-cooled diesel engine I bought, run some experiments with it, perhaps convert it to an alternator-based welder and experiment with that for awhile. Then when I have that engine well broken in, it's gonna go into the project I bought it for: a (hopefully 150+ MPG) diesel motorcycle. At that point, the generator will probably be rebuilt using my single-cylinder, water cooled Kubota diesel engine. Back to the current iteration, though: How did it work, and what did I learn from it? Well, it worked fine, given its inherent limitations. Those limitations, however, are what I'm here to tell you about; because lots of people (myself formerly included) have a pie-eyed view of what an automotive alternator is capable of. For one thing, they are incredibly inefficient. I'll come back to that. The second thing is, rated amperage. I used to assume that a 60 amp alternator would supply 60 amperes of battery-charging current for awhile, then drop to about 50 amps for awhile once the alternator heated up, then gradually taper off as the battery bank reached full charge. Not so. In fact, while it would surge to 60 amps or a bit more upon first starting up, drop to 40 amperes within a few minutes, then 30 amps within about 30 minutes, then within the first hour it would be down to little more than 20 amps. A couple of hours later it would be producing 16-20 amps, and the one-gallon tank would be empty. This was with a depleted 880 amp/hour battery bank, so it was not getting fully charged and tapering off. So we'll call it 35 amp/hours the first hour, then maybe 20 ah times two additional hours, for a total of 75 amp/hours; less than a tenth of the battery capacity. To look at it another way, I got a total of about 1000 watt/hours out of three hours runtime, and one gallon of fuel. To put this into perspective, my Indian Lister-pattern diesel engine driving the Chinese ST generator head, which is what I built to replace this generator, will put out 2000 watts continuously for 5 hours on one gallon of fuel (which can be filtered, preheated waste cooking oil, btw); that is 10,000 watt/hrs or 10 TIMES the efficiency. Between those two extremes though, I did run a 140 amp alternator with the Lister for awhile: it also used a gallon in about 3 hours, but produced approximately 2000 watt/hours during that 3 hours. From the standpoint of running an air conditioner, if you put a big gas tank on this generator and ran it 24 hours a day charging your battery bank, you would be able to turn on the air conditioner in the evening and run it, a couple of lights, and perhaps a stereo or TV for a few hours, then turn off the lights and entertainment and run the air conditioner overnight. I'm talking about a small, 5000 btu air conditioner. You could only do this if you had a sizable battery bank, and of course an inverter big enough to power the air conditioner and TV/lights/etc. Say about a 2500 watt inverter (my Trace 2500 watt inverter powers those loads just fine). You would have to turn off the A/C in the morning and leave it off all day, while leaving the generator running to recharge the battery bank. This would use over 8 gallons of gas per day. The bigger alternator would allow running only when the loads (A/C, etc.) are running, for considerable fuel savings. The best, though, is to get a diesel engine and power a 110 or 110/220 generator head, like I eventually did. With that setup I can power that same air conditioner, a couple of lights, TV and stereo, while also using the 3-step 120 amp battery charger that is built into my inverter to charge the battery bank, and still run 4-5 hours per gallon of fuel. What a difference efficiency makes! That doesn't mean the setup depicted here is worthless, though. For one thing, it is very portable and useful for short-term, low-demand use. For example, if you are camping or boondocking where you only need a little power intermittently, and you don't need air conditioning. Or as a portable means of jumping off vehicles. A buddy of mine has another good use for it: he has a flat-transom canoe with a trolling motor on it, and he likes to set up camp by the lake and go motoring around in his canoe. He has a second battery in camp, and when the first battery is almost depleted he brings it back to camp, connects it to his generator/charger, grabs his second battery and heads back out while the depleted battery is recharging. Another useful thing about a generator like this is, you can get rid of the regulator and use it as a welder. I haven't tried it yet, but lots of other people have. I intend to try it eventually, and report my results here. And one last thing. I've noticed that these alternators never seem to get very hot in use, so by losing the regulator and adding some switched power resistors to manually regulate it, including a high-power setting for welding and bulk charging, it should be possible to maintain current output at a much higher level than the automatic regulator will allow. This guy is a perfect example of the kind of pseudo-intellectual activist we are overrun with nowadays. Oh, I don't have a problem with his experiment, in fact it looks like something I would do. However, his comments about how the stupid California legislature backed away from a wonderful bill that would have mandated zero-emissions vehicles, and about how a good government would supply solar charging stations in parking lots everywhere, prompted me to post a few comments. First, government-supplied solar charging stations. Most leftist-activists have no problem with money being extorted from everyone at the point of a gun, to support projects they believe in. Of course, they don't like to have it described in those terms; they prefer to just say it's our "duty". Second, just because he lives close enough to work to make an EV a workable solution, doesn't make that true for everyone. Third, there is no such thing as a zero-emission vehicle. If you don't believe this, research what goes into the production of a battery, and what goes into recycling one. Also research how long that battery lasts before it has to be replaced. OK, I won't belabor those points. Most of you probably already know it anyway. Let's cut to the chase: demonstrating that this guy is full of crap. It's simple, when you crunch the numbers. Think of the smallest, most economical car you have ever seen. I'm talking about cars that are legal to drive on public roadways. How much horsepower does its engine produce? How about a Ford Festiva (42 mpg highway)? 65 horsepower. Or how about the Renault 5 (known in the US as the LeCar), of which this particular EV is a conversion? It was available with several different engines, the smallest of which was 36 horsepower. How about the record-breaking Loremo that is supposed to go on sale in the European market next year? That one is a good choice: it claims 157 mpg from a 20 horsepower diesel engine. Let's use that as a baseline. Now let's give Uncle Bob as he calls himself, the benefit of the doubt and say he can manage with only half that, or 10 horsepower. Let's also give him the further benefit of allowing him 100% efficiency in his setup, even though we know that battery charging is only 66% efficient, max; and that his inverter is about 90% efficient, and there are more inefficiencies that, together, would bring his total efficiency to less than 50%. We'll ignore that. We'll also ignore the fact that Uncle Bob lied right off the bat when he said that his PV panels were putting out 200 watts, when we all know that 6.82 amperes plus 6.86 amperes times 12.52 volts equals 171.2736 watts. We'll let him claim 200 watts, as well as 100% efficiency. OK, based on that, let's calculate how much power Uncle Bob produced with his setup. We'll assume he left it setup from sunup to sundown, since we're already being so generous; why stop now? The insolation index as it relates to PV panels is an estimate of the average number of hours per day one can expect full rated output from a panel. Even if the sun is up for 12-14 hours, you cannot expect a panel to produce full rated output for all those hours. Areas that receive lots of sun, like southern California, are rated at about 5-6 hours of full output. This means that, if the panel is exposed to the sun from sunup to sundown, it will produce a total amount of energy equal to outputting its rated power for 5-6 hours. Again, we'll give Bob the benefit of the doubt and allow him 6 hours. OK, crunch time: given the rose-colored-sunglasses view we have specified, 200 watts times 6 hours equals 1200 total watt-hours. One horsepower is approximately 746 watts. That means Bob theoretically stored up 1.61 (rounding up) horsepower/hours of energy. We already determined that he would need 10 horsepower to drive his car, so 1.61 divided by 10 equals .161 hour, or just under 10 minutes drive time. Again, we'll be generous and allow Bob 10 minutes; BUT we're not gonna allow him to recharge overnight on grid power (that would be blatant cheating), so he has to drive both ways on that solar charge. Hope Bob lives within 5 minutes of work, because that's all the charge he's getting. If so, I recommend that he save a lot of trouble, and just walk. CO2, carbon dioxide which is what we all breathe out. Quick, what's the most commonly referenced "greenhouse gas" that's supposedly causing global warming? PS: Why am I picking on Bob? Actually, it's because he showed us some real numbers; he was one of the more believable green activists on Youtube. Youtube is absolutely full of videos about free energy (I don't classify PV with that group, btw: I know PV works; in fact I have some panels myself), and most of them show a tiny load like a light bulb being driven by a contraption that is, itself, being powered by a car battery or some such. Of course, they never show you how much power is being withdrawn from that car battery to drive the contraption and power the light bulb. Those crackpots aren't even worth taking the time to debunk. When they show me a single car battery driving a contraption which is powering an air conditioner for a few hours, I'll take notice. I would like to have one of these old washing machines. There's no reason they wouldn't still do a good job washing laundry. Aww, MAN this is what I'm talking about! Quartzsite, Arizona is the mecca of fulltiming RVers. This is great! This family is living the RV life, full time. They are a wonderful example of what this site is all about. Man, just think of the memories those kids are gonna grow up with! Let's delve a little further into this family. An anonymous visitor commented that "this is easy when you have a million-dollar stock option". My first thought was, OK, if that is true, it would indeed make it easy, but it wouldn't make it possible. It's possible, regardless of ones level of income, to live fulltime on the road, as can be attested by several fulltime vandwellers and RVers who frequent this site. Even if all you can afford is a $500 beat-up old van and enough gas to get someplace where you can work a temp job for a few days to re-fund before moving on to the next horizon. After all, even the relatively upscale form of the lifestyle this family was living at the time the video was produced, only cost them about $2000 per month; and the RV was 10 years old when they bought it, so that kept startup costs reasonable. My next step was to find their webpage and learn more about them. I never saw any mention of exactly how much money they had (not that it matters), but it did detail how they pretty much started on a shoestring in the early '90s and worked for about a decade, saving and investing as much as they could. In other words, they did the right things and made some good decisions, and in 10 short years they were in a position to take full control of their own lives and basically retire while still young. That sure doesn't sound to me like somebody else funded their lives so they could become "irresponsible vagabonds". In fact, it makes me like them even more. Why buy an RV when you can build your own? There's no whitewater in Alabama. Nah. Just nice, placid little flatwater paddling creeks like this one. Here's more info if you're ever in the area and want a nice, relaxing day of paddling.